Longevity:Never wears. Never Expires. Lasts Forever. Material:Non-Toxic. Non-Radioactive. Made in the USA. HOW DOES THE UVO WORK? 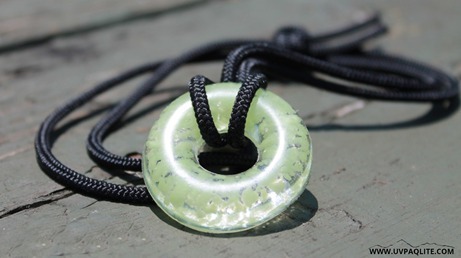 The UVO absorbs light while it hangs around your neck while you're exploring. In the dark the UVO glows all night long...you'll be amazed! The UVO is surprisingly bright in very dark environments. Take it off to help you find items in the dark, leave it on your neck to have a night light in your solo tent, or swing it in the air to make a signal at night. Increase the brightness by wearing a light/white colored shirt. CAN I USE IT AS A SIGNAL AT NIGHT? In a nighttime emergency situation, the UVO can be swung in a circle to make what is called a buzz saw. Does it replace a flashlight? We wish it could but unfortunately, it does not project light - so keep your flashlights! It's always important to have a backup light source. Anyone! If you enjoy exploring the outdoors, you just like glow-in-the-dark, or you just like to pack light. This is something easy to keep on you. Kids like it because it glows in the dark and parents like it because it makes them easier to see on a camping trip. 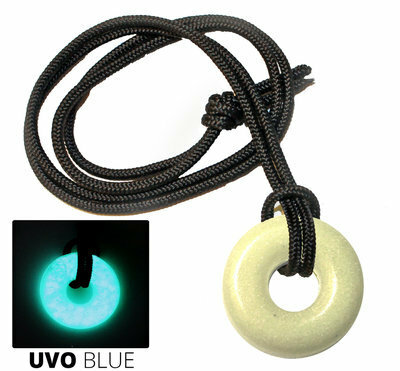 Our glow donut is great to wear to concerts too! I have both necklaces. The blue is my favorite! You don't see things that glow blue too often so I HAD to get it. I love it. I wear it almost everyday. When are you guys coming back to Cali for a show?